The legacies came about from the generosity of individuals who contributed towards music development. The SAMRO Foundation administers a number of bequests, investing the funds in order to provide music bursaries and study awards to deserving candidates. SAMRO members, music aficionados and members of the public are encouraged to invest in the country’s music legacy for generations to come by making a donation or making provision in their wills and testament to fund a recurring music study grant which is one of the greatest gifts one can leave to future generations of musicians. SAMRO Foundation welcomes bequests and donations, which assist the Foundation in contributing to music education and to supplement its budget and continue its work in service of the local music industry. These awards, funded by a magnanimous bequest from the late Eve Gettleson, were offered for the first time in 2000, and will continue to be available every fourth year as ancillary study grants in the Western Art Music genre of the quadrennially rotating SAMRO Overseas Scholarships for Instrumentalists. They are specifically intended for talented young South African string-players. Eve Gettleson, born in London in 1913, studied the violin in her native city under Max Rostal and others. She made her solo debut at the age of 17 under the baton of Sir John Barbirolli in Lalo’s Symphonie Espagnole at the Queen’s Hall, at that time London’s leading concert venue. Ms Gettleson subsequently became a founder-member of the famous Philharmonia Orchestra, in which she worked under such noted conductors as Richard Strauss, Otto Klemperer and Herbert von Karajan. In 1956 she joined the SABC Symphony Orchestra and remained a member of its violin section, and that of its successors, for a period of almost four decades, until only shortly before her death aged 82 in 1995. Bonhams, established in 1793, are one of the oldest-established London auction houses, and have one of the world’s foremost musical instrument departments. A fine 18th-century violin, part of the Gettleson bequest, was sold by Bonhams, who have since held several series of Valuation days in South Africa. They have generously made a proportion of their South African sales-commission available to help fund these two study awards – one for Western Art Music, and one for Jazz/Popular Music – each currently worth R3 000. This award is funded by a bequest made by the song-writer, Anton de Waal (1917–1974), a member of SAMRO who also served on its Board of Directors. Together with Nico Carstens, his frequent collaborator, Anton de Waal wrote a number of favourite South African hits, including the evergreen Zambesi. The National Opera Association of South Africa (NOASA) and the Opera Society of South Africa (OPSA) were formed in the mid-1950s with similar aims of promoting operatic art in this country. In 1957, NOASA and OPSA combined to form the South African Opera Federation (SAOF), which, between 1958 and 1962, presented 12 operas in Gauteng. Following the formation of the Performing Arts Council of the Transvaal (PACT) in 1963, SAOF suspended its production activities and was divided once more into its constituent bodies. NOASA undertook community music service, while OPSA went on to present an ‘OPSA Prize’. Winners of the OPSA Prize in recent years have included tenor Musa Nkuna, sopranos Sally du Randt and Sally June Gain, mezzo-soprano Elza van den Heever and bass-baritone Abel Moeng, who was also winner of the SAMRO Overseas Scholarship (Western Art Music Category) in 1999. Cyril and Peta Fisher, who both died in 1995, were the guiding spirits of the Music Viva concert society from 1954 until its demise in 1980. 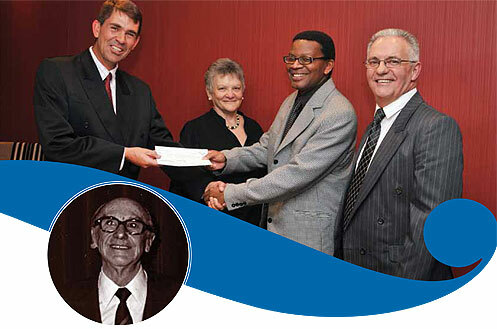 Their generous bequest has funded two keyboard study awards, one in each genre, which are offered every fourth year as part of the SAMRO Overseas Scholarships for Keyboard Players. These awards are individually worth R10 000 each. This award, funded by a magnanimous bequest from the late Maisie Flink, is offered every fourth year as part of the SAMRO Overseas Scholarships for Keyboard Players, and is intended to encourage promising young South African pianists. Maisie Flink studied the piano in South Africa with various teachers, the most important of whom was Adolph Hallis, and obtained her LTCL aged only 16. She later undertook several periods of advanced study in New York with the Russian émigré Nadia Reisenberg, who had herself been a pupil at the St Petersburg Conservatoire of the famous piano pedagogue Leonid Nikolaev. Through Reisenberg’s mentorship, Maisie Flink gave the first South African performances of major modern Russian piano works, in addition to her acclaimed performances of a wide variety of other repertoire, not only as a concerto-soloist, but also as a recitalist, chamber-player and accompanist. These activities were complemented by some 3 decades as a Unisa Music examiner, as well as many years – almost until her death, aged 83, in 1998 – as an active member of the South African Society of Music Teachers and the Johannesburg Musical Society. An example of how the legacy of musicians and music lovers can endure long after their passing is the Ralph Trewhela Award. This music bursary is named in honour of the late South African music pioneer, a prolific composer of light music for musical comedy and revue shows. His children have generously bequeathed their father’s future royalties to the SAMRO Foundation, to offer bursaries to deserving young South African composers to further their tertiary music education. This legacy project comes to a close in the year 2020 and started in 2009. The recently established Surendran Reddy clazz Award is available to candidates in the composers’ round of the SAMRO Overseas Scholarships Competition.This special award has been created in memory of Reddy, a renowned South African composer, pianist and teacher, who passed away in 2010. This bequest will benefit young composers who create outstanding fusion music in the “clazz” style that he coined – incorporating elements of classical and jazz music. Thanks to a donation by the Roodepoort International Eisteddfod of South Africa, special bursaries are offered annually to undergraduate students specialising in performance.